You could not have asked for a better performance to shake off recent woes and close off the first half of the season than what we saw from the Minutemen last night. It may be as close to a complete game as they’ve played all year. They showed some offensive firepower by peppering Merrimack goalie Andrew Braithwaite with 33 shots through the first two periods and went 1 for 3 on the power play. Then when momentum swung to Merrimack’s favor in the third with the help of a 5 on 3 power play, they were able to shut things down and really play well defensively. Paul Dainton played extremely well last night. Though he wasn’t tested too often in the first couple periods as the Minutemen held Merrimack to 18 shots in that time, the shots they did get off were good ones and Dainton was able to turn them all away save for one from Stephane DeCosta on the rush. Dainton made 11 saves on the late Merrimack power play and 5 on 3 sequence alone. I think last night’s game showed what the game plan should be for the rest of the season. First off, the SWarM line was back together and probably would’ve had a few more points if not for the good job by Braithwaite to keep the Warriors in the game. Secondly, the team was allowed to be aggressive and use their speed to their advantage and it directly led to two goals, Ortiz’s second and the Syner shorthanded goal. I really believe opening things up and letting the team play to their superior skating abilities is what made the shots so lopsided for much of the game. Ortiz continues to have strong two way games and is having the senior season we all were hoping for. His first goal was a nice putback off a Langeraap rebound. Some may say the second goal was gift wrapped (tis the season) as the Merrimack player put it right on his stick in the slot all alone, but this really comes back to Ortiz out there putting effort into a quality forecheck and just getting in passing lanes. His seven goals season to date match the number he put up in both his freshman and sophomore years. Here’s the official recap from the athletic department. No by-line for him but UMass alum Joe Meloni has the game story in the Republican crediting Dainton’s spectacular save in the third as the turning point of the game. Will Ortiz pegs Dainton’s save as the game changing moment in the USCHO recap as well. Elsewhere around Hockey East last night Northeastern continues to struggle as they lost 5-1 up in Orono, Maine. 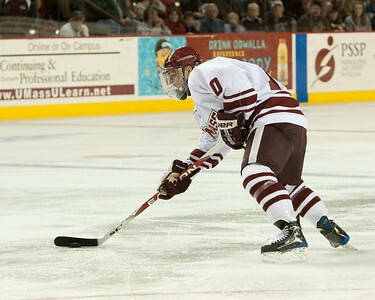 BC was victorious over Providence 3-1 and Lowell surprisingly dropped a game to Princeton at home 3-2. Lowell did get some good news yesterday as they received a committment from goaltender Doug Carr who also visited UMass and was receiving interest from some ECAC and Atlantic Hockey schools. Just because the team is on break for a few weeks doesn’t mean Fear The Triangle will be. As this is the unofficial halfway point I’ll be doing some mid-season recaps in the next few days to summarize the team’s successful campaign thus far.